Feeling trapped by $90k of student debt, I challenged myself in August 2011 to seek freedom and become debt-free in ten months instead of 15 years. I started this no-longer-anonymous blog to track my progress. The crazy adventure begins with the first post and ends seven months and 87 posts later when I proclaim victory and reflect on what the experience taught me about life and money. 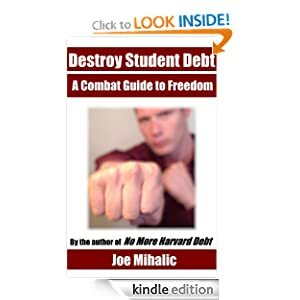 In August 2012, I released the book Destroy Student Debt: A Combat Guide to Freedom, which I wrote to help people pay down their student debt early. These days, I live a simple and balanced life of working, working out, and spending time with friends in Austin, Texas. I live well below my means and enjoy the sense of freedom inherent to that lifestyle. Hi there. Love your quest for debt freedom. I’m the CEO and Founder of Payoff.com and would love to talk with you about what you’re up. Email me at scott@payoff.com and let’s talk. As a JD/MBA with a boatload of student debt who lived in Austin for about five years, I’m digging your blog on multiple levels. Good luck! Love to hear comments like this, and glad you’re digging it. Why 10 months instead of a round number like 1 or 2 years? Good luck! I’m hoping to pay off my loans soon too. Thanks, Michelle! Best of luck!! — I loved this and the practical lifestyle you lived given your debt. I couldn’t agree more with your quote on cnn. My ex and his fiancee both have prestigious MBAs, but when his employment with a top mgmt consulting firm ended, he refused to modify his lifestyle. Don’t know if it’s peer pressure or just narcissism. But in the time he has been unemployed he has traveled around the world for such things as the Stanford GSB’s Miami FOAM party, European weekends, exotic vacations, bought a second home, weekends on Nantucket, and on and on… all while petitioning the court to pay reduced child support due to his unemployment. I also have an MBA but was wise enough when becoming a single parent to disregard what my former classmates might be doing (and more importantly what they might think) and modified my lifestyle to fit my means… and on potentially less child support (trial still a couple months away) while my ex continues to live the MBA lifestyle while unemployed. I really enjoyed reading your blog. I could go on and on about the high cost of education and the debt burden many face… but that isn’t in your control… I admire what you did given the situation. WOW! This is something ALL (pre and post) students need to watch. My 3 daughters are wallowing in debt from education. It makes me ill when I think of how I pushed them. I am considering a different route for my 4th daughter and that’s saying alot since I work at a university! Aren’t I supposed to be selling the product? Something has to be done so thanks for sharing some incite and ideas for those still buried. . .
That’s interesting…maybe try pushing the fourth toward a degree with a high ROI? I know many Americans are impressed with your actions, but I am not. I was born in India and have been living in US for more than 10 years. I completed part-time MBA from Chicago Booth (incurred flight costs) and my wife will do so from Haas. We are student-debt free from day one. Instead of going to both extremes like you did, we planned our future and lived frugally. Used maximum of employer tuition reimbursement and, at the same time, maxed out both 401 (K) accounts and received employer matches. We are hardly alone. I know many Indian couples who do so. Your blog is a fun read because you took extreme decisions. But what we did has more value (in my opinion) because we were consistent in our lifestyle. Really great perspective–thank you for sharing it. Boothhaas, it’s strange to compare two different cultures. Maybe in the Indian culture you don’t accumulate student loan debt but here in America it’s business as usual. I think comparing apples with oranges is a wash. As an AMERICAN I am very inpired by this young man’s achievements!! Wow – That’s all I can say. I too, am trying to widdle down a series of loans from a top tier school that totals more than my after tax wages. I feel two things after reading some of your entries – One, I really have absolutely to whine about and I’m barely doing anything to help myself. Two, complete inspiration to make some drastic changes to dig myself out this hole! Will I stop buying clothes? No, because well, I’m a girl and I just can’t do that, but there are PLENTY of other sacrifices I can make to get myself out of debt. THANK YOU FOR TELLING YOUR STORY! followed a link from cnnmoney. I’m stressed about my student loans (along with all other expenses, given the current state of the economy) and will soon be pursuing an advanced degree to better my job prospects and possibly change careers. Reading how you did it, I know it’s possible and that is reassuring. Congrats on your success. Good luck, dude. You can do it. Stumbled across a fortune/cnn article today that led me to your blog. I funded most of my law school education with earnings from a previous career, but still graduated in May 2011 with 65K in debt. I’m lucky to have found a job in late 2011, but I’m still stressed about paying bills, a mortgage, and student loan payments. Thanks for showing us that it IS possible! You can do it, Leslie! Believe in yourself. Hey! loved your pursuit. I’m going in HBS this fall, and so great timing for me to stumble across your experience. I’d def keep this in mind and be mindful – thanks tons for sharing. This is so awesome! I immediately called my husband and sister (plenty of student loan debt between the two) while I was reading this. My sister’s first words “how did he do it?” I think she was expecting some quick-fix but I explained some of the tougher parts like you didn’t go to a movie, buy an item of clothing, etc. I am currently in grad school and the first thing I want to do when I graduate is pay off these loans. Your blog is very motivating. Any advice for a grad-student accumulating loans? Congratulations to you! May you continue on your path of “doing well and doing good”. You have the potential to help many others and I think you will. I too know the crunch of pulling out of debt, and couldn’t agree with you more about the freedom of living with a lot less stuff and the (unforseen)benefit of reduced lifestyle choices. pretty inspirational, im gonna try this too. lets go! Congratulations, Joe! Such a huge accomplishment to pay off your student loan in less than a year–I am impressed! I just read your story on Huffington Post and was inspired! I’ve been planning on going back to school and getting my MBA but was afraid of student loans. Then I read your story and now I’m motivated to go just for it! Thank you for sharing your experience with us, I will definitely cut back on spending. 🙂 Best of luck to you with your career and continued success! you, sir, are inspirational! congratulations and many thanks for inspiring others to try the same! I am in a similar financial situation after pursuing undergrad and an MBA at a private university. It is very inspiring to see this can be accomplished, and that I, too, can pull myself out of debt. I commend you for the sacrifices you made to get to this point. This website is interesting. I am like the Indian fellow above in terms of frugality. I graduated from my PhD with mere 8K in student debt (that I plan to reduce to zero in a matter of months as soon as I start my new job next month; I also have outstanding credit card debt that I will reduce at the same time which is why it will take longer than I want). What worries me though is the future of extremely high tuition rates at good schools, public and private alike even for undergraduates. Will there be any way to avoid a situation such as yours in say 10-20 years for anybody who is not born into a super rich family? Love your story! While there are different ways of achieving higher education (I went the company tuition reimbursement route and saved/paid cash for the balance like another person did above for my MBA), you went perhaps the more challenging route and came out more successful than you may have thought before going in. You are a true role model to society today and I hope that your story is shared across the masses. Our society seems to have lost touch with the concept of financial security and the value of cash. Congratulations on an amazing achievement! Fantastic! What an inspiration. I am in a similar situation, paying off my student loans. I am looking forward to put some of your techniques into action for myself. Wow this is an amazing and truly inspirational story! Congratualtions and good luck to you in your future endeavors. Great job! As someone who also has a lot of student loan debt, it is nice to see a story of someone else making sacrifices. With a kid its a bit harder to pick up a second part time job, but I am trying to start a couple websites in hopes of making some money. Besides the registering the domain and paying for hosting (which isn’t much), I get all my info from the library or online rather than buying books. How soon should I start increasing the amount payed towards my monthly off my loans after i graduate? I am a nursing student and I’m hoping on getting myself established in San Diego so I can start investing in properties, start a business, etc. I have about 25-30k in loans by next year. What would you suggest as my initial actions post-grad? Thank you and your blog is AWESOME! Congrats on reaching your goal ahead of time. I think this is absolutely amazing and inspiring. I am always trying to think of ways to downsize or save money. Now you have a huge weight lifted off your shoulders and some free time to go out and continue living. Get married, start a family, now that you’re “famous” I am sure neither of those things will be hard to find/do. Hey Joe I came to your blog via Yahoo News. What American doesn’t love a good success story? 🙂 Congratulations that is really awesome. And I’m sure it must be totally overwhelming to go from being Joe Blow…(sorry I couldn’t resist…) to all over major media outlets overnight. I love the humbleness and perspective of your most recent post. You didn’t ask to be the poster child and solve everyone’s money problems. You just started a blog….like millions of people do. So really, ignore the haters. They’re just jealous. Joe, your story is inspirational for me. I am a 2011 graduate from Columbia University College of Dental Medicine. I’m finishing my residency next month and have racked up an astounding $355k in student loan debt after interest. The total amount borrowed to cover the cost of my education was $299k. I’ll be starting work in July with a base salary in the mid-100’s but I’m constantly stressed about making the payments on my debt, which will be around $4200 per month. I am definitely going to use your budgeting model to guide me through my repayment years ahead! What do you think about joining Teach for America, working at a low-income school or joining the military as a way to pay off loans (and of course being a respectable form of service)? It seems like it doesn´t pay so much in the end if you just make x salary and put all that you have towards it…but I wanted to know what you thought. I just came across your article in the Seattle Times! I decided to check out your website. Thank you for writing about your story. I get sick to my stomach when I think about the debt I will be in by the time I am finished with graduate school. Impressive. Its been, well 2.5years since I graduated and well I have been managing fine – enjoying the joys of first salary and living very far from frugally. However, feel that its time, I hit the accelerator as I refuse to be paying of a loan till I am 40+…And was directed to your blog by a friend…plan to use some of your ideas…. Having said that, I live in Asia and it seems like we can’t buy your ebook here…is there anyway of getting a copy? I’m still gasping at what I heard the other evening: A woman talking of how she is still paying off her son’s college loans….she is 70!!! She is living a modest life, worries about money like so many older folks, this was news to me that on top of everything else she was paying college debt. Perhaps you could speak a little more loudly. I had NO idea this was a multi-generational problem; what a disaster! oh, boy…I’m not even gonna go there. What a fantastic story. My husband and set a similar goal 5 years ago, except our goal was to pay off the mortgage as soon as quickly as possible. We are 5 months away from completely paying off our mortgage. We paid off all other debt years ago. It feels great to be almost debt-free. Good for you guys!! It must feel awesome. I wanted to send you a thanks! My wife and I started our TMM from Ramsey about 3 years ago and have paid off about $100k, but it took us $230k and 3 years to do it. We’ve been through about a 25% reduction in income through this process, but I have a plan to turn that around. I was just introduced to your blog through a news story and it has re-ignited the fire to shorten the time frame on our remaining non mortgage debt (a little more than I’ve already paid off). Having a family with a little one prevents me from taking some of the more drastic measures you took (i.e. roommates), but I can still get a lot more aggressive. You’ve made a lot of progress! Good luck on tackling the rest of it. Much thanks for your honesty here. Totally badass! I hope it makes peeps think twice about the pros & cons of a costly education. As someone about to graduate from an ivy league law school with over $200k in debt, I found this blog incredibly empowering. I don’t think I’ll resort to the extreme change you did because it isn’t my goal to pay off my loans on such a quick schedule. But I will make a concrete plan to pay off my student debt as quickly as possible, forgo all that I don’t need to be healthy and happy, and find a way to declutter my life (financially and materially). Thanks for sharing your journey. This is complete inspiration and a straightforward reminder to not only keep our budget in balance but our life values as well. Thank you for sharing your journey to enable others to find that “richness”. I saw your story through Mr. Money Mustache and followed the link to your youtube video. When I saw the clip where you paid off your loans completely, I got a little misty-eyed. I am writing a website about my journey to pay my student loan debt. I have a little less than $25k left and I feel like I’m suffocating. It is SUCH an inspiration to see that you paid off $90k in seven months. I don’t own a house or an extra car or anything huge to sell but I did just start a second job and I’m excited about the extra income. Cheers to you! Thanks for being brave enough to share your journey. Keep up the great work, Chelsea. I just added your blog to my blogroll so that you can pay the inspiration forward. Thanks for sharing your story. I have about 29K in loans from grad school that I’m paying way more than a rent payment each month and should be out in a year. I have the same attitude you do, being debt-free means more than any material thing does. Also, I knew a guy who was a real jerk who is currently at HBS and he was always obsessed with proving himself. Are the people there any happier than the rest of us? Thank you for your time. I am part of a Stanford Technology Entrepreneurship student group. We have come up with a crowd funding platform for reducing student loan debt. Can you take a look, and comment on our process? We are testing our value proposition and are in need of feedback. Your blog is providing me so much inspiration and motivation. Just wanted to send you a quick thanks for sharing your story on this blog. As a recent admit to a top-20 MBA program (I’ll be starting at Duke in the fall), I actually found myself pausing to consider the implications of the taking on such an enormous debt load. I realized that my relatively dynamic career to date (some tech stuff, a few years with Peace Corps, trying my hand a startup) was largely made possible because I was debt-free. While a top MBA promises to be a great experience that will create career possibilities not open to me now, I began to wonder what sort of sentence I was in for after I graduated. Would I need to defer any future risks (career choices, business ideas, etc.) while I paid off my debt and for how many years? It’s great to know that, with discipline, it is possible to buck the trend and return to an adventurous life sooner than I’d previously thought possible. We’ll see how it goes! You’re honestly an inspiration to me. I’m so stressed about the amount of debt I’m accumulating in college (Even though I know it’ll land me with a well-paying job). I know I can make the 1,000 dollar payments because my debt will also total to 120,000 due to similar circumstances, however, I’m motivated to knock my debt out as fast as possible and you’ve given me the inspiration to do so. Thank you for giving me some peace of mind. I just stumbled upon your blog, and I’m loving it. Thanks for taking the time to share your experiences! I admire your candor. I am Thomas from Singapore. Read about you through CNN Money. Wonder if you’re interested to collaborate on Indiegogo or Kickstarter project. Hear from you. Wow! What I can say? Well, I have designed Zero Cost MBA and executed it very well over the period of 2 years keeping me completely debt free. It is good to see people like you around. Great blog. I read about your story a while ago and it inspired me to get out of student loan debt as well. I had $65K in loans when I graduated in ’09 and had been on a 30 year payment plan. I realized about 2 years ago that I barely put a dent in it so I refinanced and got it down to $13K as of now by living below my means and putting as much as I can towards it every month. Last night I took out a loan out of my 401K to pay down the final $13K. The student loan was 4.25% interest and the monthly payment was $625 a month since the refi I did a while ago when the balance was larger and had a 5 year pay off plan regardless of how much prepayment I did. I read a lot about the perils of 401k loans but felt that the amount is relatively small, the stock market has been kind of stagnant and overvalued and I don’t foresee things getting better so I don’t think I’m missing any compounded growth. Also the interest I’d pay on the 401k is 3.25% and I pay it to myself over 4 years with $133 biweekly payments. I could also pay the 401k loan back more quickly than 4 years if I wanted to with no penalty. I will be able to continue to contribute to my 401k with my employer match while also repaying the loan. I feel like I thought this through and don’t see much downside to doing it, but just wanted to hear your thoughts. I just will feel so much better having zero student loan debt, not having the 625 a month payment (instead will have a $266 a month 401k loan payment). I also intend on putting more than the 133 towards the 401k loan as I can so thinking I could pay it off in 1-2 years. I read through the presentation made for the 12-18year olds – I think it’s incredibly valuable that kids gain this perspective early on. Maybe you can consider reaching a wider audience by putting something out on YOUTUBE? This is where they seem to be spending a lot of time. Something entertaining and cool in video form with the insights you have would reach more of the youth in a platform they enjoy (compared to a “seminar/ talk/ blog entry” ) Please consider. All the best. Pingback: Attitude and Abundance: Why our attitude toward money matters – Wealthy. Healthy. Free.